Since poultry have no teeth they have evolved to peck grit which helps to grind their food in the gizzard. Oystershell. limestone or flint grit should always be available (in a separate container to the feed) so the birds can help themselves. These are a source of calcium to provide strong shells. 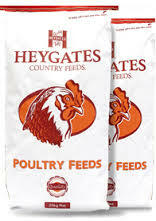 Heygates feeds have sufficient added limestone for birds which are fed ad-lib pellets or meal. This product is a mixture of flint grit, limestone grit and oystershell grit.